In recent years the bench press has become probably the single most widely used weight training exercise. A considerable amount of weight can be lifted in this movement. World record lifts of up to 2942 N (661 pounds, note: 1 lb. = 4.45 N) have been set and lifts of over 1335 N (300 pounds) are not uncommon in even high school age individuals. Performance of the bench press involves initially taking a barbell at arms’ length while lying on a bench, and then lowering the bar to the chest. After a momentary touch at the chest the bar is then pushed back up until the arms are again fully extended. Although barbell and dumbell lifting first became significantly popular in he late 1800’s and early 1900’s, at that time the bench press was almost completely unknown as an exercise. This exercise also appears very rarely in the books and magazines from that period on, and it was never done either as a competitive lift or as part of the presentation in strong acts in the circus or on stage. Following the Second World War, however, its popularity sky-rocketed due to several factors, among which are the comfort during execution and the overall developmental qualities for the upper body. Its growth has continued to the present to the point where it is now generally considered by far the most frequently used of any weight training exercise. In recent years the public has increasingly been made aware through the media of the value of weight training to general fitness, athletic sports of all types, rehabilitation, etc., by, for example, Olympic television coverage of East German and Russian training methods, etc. The importance of upper body strength in non-contact sports has even received a strong recent emphasis. In other words, it is now deemed necessary for a jogger or distance runner to have good upper body strength in addition to well-conditioned lower extremities. Additionally, competitive and recreational athletes have turned to weight training programs to develop upper extremity strength and endurance. Thus, almost any weight lifting program at present includes or centers around the bench press as a primary lift and developer of the chest and upper extremities. First, the practice of using weight training as an integral part of an athlete’s preparation has become increasingly common. The bench press has become one of the principal exercises used in developing upper body strength. Indeed, performance in this lift has even become important in some sports (especially football) as a fitness measure for recruiting, publicity, etc. A second group consists of the ever increasing number of bodybuilders and recreational weight trainers among the general public. Although these individuals lift primarily for enjoyment and to maintain and increase fitness, their interest in performance and safety is undeniable. A tour of any gym or health spa will typically indicate more people bench pressing than doing any other exercise. Again, the lift is VERY comfortable and reasonably heavy weights can be lifted. It’s interesting to note that among the general population the question typically asked of a person known to lift weights used to be “How much can you press?”. Today it has frequently been replaced with “How much can you bench press?”. Indeed, bench press competitions (where only the bench press is contested) have become increasingly popular in recent years. The bench press is also one of the three events that comprise he popular international sport of Powerlifting. The numerous participants in this sport are certainly interested both in improving their bench press performance and reducing their probability of injury from training this lift. Finally, the sports medicine community has expressed interest in recent years regarding injuries, both chronic and acute, associated with the bench press. A better understanding of the bench press would provide useful information regarding both injury mechanisms and prevention. Despite the widespread use of the bench press, there are no studies reported in the literature (as of the writing of this book) that have analyzed the bench press as an upper body strength building motion. Only studies related to the function of some of the muscles involved in bench pressing have been reported. For example, Rosentwieg, etal. (10) Have reported on a study of isokinetic bench pressing using electromyography with a sub-set of the muscles crossing the glenohumeral joint (deltoids, biceps, triceps, and pectoralis major). Jonsson and Jonsson (4) looked at a totally different sub-set of muscles crossing the joint in relation to driving (supraspinatus, infraspinatus, teres major, and teres minor). Deluca and Forest (3) reported on a model for predicting the muscle loads for a subset of muscles involved in abduction. There are also a number of papers (1, 2, 5) that present the function of some of the muscles involved with the glenohumeral articulation. Overall, however, no direct biomechanical or electromyographical studies of bench pressing with weights exist. Due to the lack of literature on bench pressing, a group of us began several years ago at Auburn University to fully investigate the bench press movement. The research team consisted of the author, Nels Madsen, Ph.D. (Department of Mechanical Engineering at Auburn University) and Bill McLeod, Ph.D. (Bioengineer and Director of Research, Hughston Orthopedic Clinic, Columbus, Georgia). 1.) How best to perform the bench press to optimize a lifter’s muscular force potential. 3.) What stresses are placed on the body (particularly the shoulder) in the lift, and how these can be minimized to allow safer lifting. To date, we have made some progress toward all three lines of our research, but as yet we have only published or presented a few of our findings (6, 7, 9). 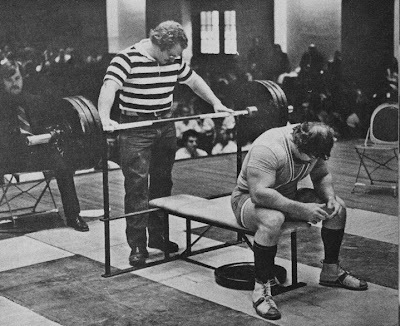 So far, about 120 bench trials of National and World class powerlifters recorded on high speed cinematographic film collected at the 1974, 1978, and 1978 U.S. Senior Nationals, 1979 Worlds, and the 1980 World Series have been subjected to 2D or 3D biomechanical analysis. An additional 40 film trials of beginners and intermediates, along with lab studies (using high speed 3D film analysis with synchronous EMG ‘muscle’ monitoring) of the current World Superheavyweight bench press champion and others have also been analyzed. The first major study, Madsen and McLaughlin (7), was designed to learn enough about the bench press to be able to propose testable hypotheses about its performance. The goal was to build a foundation for future research on the bench press. Of primary concern was the identification of kinematic factors that might be relevant to performance and injury risk in the bench press. Also of interest was the identification of any fine structure that might exist in the kinematics and kinetics of the bar movement. To investigate the bench press, a study of the kinematics and kinetics of the bar was performed. Although the arm movements in the bench press are three-dimensional in nature, the end of the bar moves in a plane. A study of the two-dimensional motion of the bar was deemed appropriate as a starting point for research. In light of the fact that the objective of the bench press is to raise the bar, the characteristics of the motion of the bar must be understood before an investigation of the underlying phenomena can be begun Ultimately, three-dimensional studies will be required, and have been initiated (6). High-speed two-dimensional cinematographic procedures were utilized to record the performance of 19 world-class powerlifters proficient in bench pressing while competing at the 1978 and 1979 U.S. Senior National Powerlifting Championships, the 1979 World Powerlifting Championships, and the 1980 World Series. Each world-class powerlifter was ranked in the top three in the world in the bench press at the time of his lift. Top bench pressers from the ranks of Powerlifting who were subjects included Bridges, Wright, Franz, Rafael, Bradley, Crain, Gant, Pacifico, Gaugler, Estep, Sideris, Woods, Thomas, Hatfield, Wilson, Anello, etc. An additional 17 “novices” (average training time on the bench press was 10.2 months) were also filmed under similar conditions. Biomechanical film reduction and analysis techniques were used to investigate the barbell motion characteristics of all subject from a side view (see (7) for more details). The analysis revealed a number of important characteristics of the performance of champion bench-pressers (which will be discussed in detail in subsequent chapters). First, they clearly minimized the bar’s vertical acceleration while lowering the bar (average peak acceleration typically less than 1 m/s/s). Second, there were significant differences in the geometry of the sequence of movements used the high-skilled lifters versus the novices. It was found that this especially involved the magnitudes of the horizontal components of the motion of the bar during the lift (experts used a bar path closer to the shoulders) and in several key angles describing the bar’s path. Third, the high-skilled lifters were found to have less difficulty with the “sticking point” period of the bench press lift than the beginners. There was also no significant difference in torque required at the shoulder. It was evident that the high-skilled bench pressers had over time adopted a common pattern of bar motion. The existence of this unique pattern is clearly evident from the results of this study and significantly differs from the “novice” patterns. The horizontal and geometric alterations in technique that the world-class lifters have adopted have a number of theoretical advantages over beginner or classically recommended techniques. The results of this study also have important implications regarding training procedures and potential injury mechanisms for anyone using the bench press as a weight-training exercise (to be discussed later).